“Here I am, Lord. Is it I, Lord?” Together we sang familiar hymn this morning, a hymn loved by many. It’s words bring to mind images of ancient prophets like Samuel and Isaiah and so many others, who answered the call of God. Eagerly adding our own voice of affirmation to the refrain, we boldly sing, "I will go Lord! If you lead me!” There’s no hesitancy, no question - just quick obedience. Each of texts this morning have an element of one called by God to tasks unknown. And yet, if we look closely - a quick response without hesitation - isn’t how the people respond to God. It takes a little more elbow twisting! Our Hebrew Bible text recounts the call of Isaiah. God comes to him in a vision in the temple, surrounded by Seraphs exclaiming Holy, Holy,Holy! Isaiah is filled with shame and unworthiness, and says: “Woe is me! I am lost, for I am a man of unclean lips and I live among a people of unclean lips!” I am a sinner and I’m surrounded by sinners, surely you can’t be sending me to do anything. And yet, God calls - and Isaiah follows God’s call on his life. Perhaps you remember Paul’s call. Acts Chapter 9 tells us that while Saul (who will become Paul) is “breathing threats and murder against the disciples of God,” he is blinded on the road to Damascus. Here he encounters Christ and his life is forever changed. And yet, in his letter to the Corinthians we can clearly see Paul still doubts his worthiness. He calls himself the least and unfit because of his persecution of the church. And yet, God calls - and Paul follows God’s call on his life. Finally, in our Gospel reading for today, we hear Jesus call his first disciples. Standing beside the Sea of Galilee, people are desperate to hear Jesus. He sees two boats on the shore and decides to jump into Simon Peter’s boat, asking him to pull a little way out from the shore. Now Peter earned his living as a fisherman. After a long night of fishing, he has come up short, and I am sure that frustration and worry weigh heavy on him. After all, he is a fisherman with no fish. Perhaps humoring Jesus, he obeys. After teaching the crowds from the boat, Jesus tells Peter to go out into deeper water and put down his nets. Now we begin to hear a bit of frustration from Peter. We’ve been working all night and have caught nothing! I’ve already cleaned my nets! I’m tired! I want to go home! But once again, Peter obeys. Out in the deep water, they drop the nets. The nets fill with so many fish that they begin to break and James and John have to come help them. Both boats are filled with so many fish that they begin to sink. Here is where Peter loses it. Amazed by the catch of fish, he says: “Go away from me, Lord, for I am a sinful man!” I’m not good enough for you, Jesus! And yet, Jesus calls him anyway: "Do not be afraid, from now on you will be catching people.” And Peter leaves everything to follow God’s call on his life. Surprisingly, this is not the first time Peter meets Jesus. In the Gospel of Luke, this isn’t their first encounter. If you think back on our Gospel lessons the past two weeks - Jesus preaching in his hometown of Nazareth - you might remember that the people there want him to “do what he had done in Capernaum.” The text doesn’t tell us exactly what Jesus had done there - but it had to be pretty amazing if they wanted him to do it for them in Nazareth, too! Capernaum was Peter’s hometown. It was a small fishing village on the northern shores of the Sea of Galilee. Peter, James and John were in the fishing business together - partners - middle-class business owners. If something amazing happened in their village, they would be sure to know about it. After Jesus escapes from nearly being thrown off a cliff, there are two stories the lectionary leaves out. In Luke chapter 4 beginning with verse 30, Jesus goes from Nazareth to Capernaum. In the synagogue there, he heals a man with an unclean spirit. Then, in Luke chapter 4 verse 38, Jesus leaves the synagogue in Capernaum and goes directly to Simon Peter’s house, where he heals his mother-in-law of a high fever. So, according to Luke, before he ever encounters Jesus on his boat - he has at least heard about amazing things he had done in his village, he had most likely seen him heal a man of an unclean spirit, and he had witnessed Jesus heal his mother-in-law in his home. These all sound like pretty extraordinary events …. and yet …. none of these things lead Peter to leave everything to follow Jesus. It isn’t until Jesus lands him boat-loads (literally) of fish that he is amazed enough by Jesus to feel unworthy in his presence and then to follow his call. An abundance of fish does the trick. What is with that? -- You see, this miracle affected him in a personal way. It wasn’t for someone else, it was for him. Fishing was his livelihood. No fish - no money. No money - no food, no security. Suddenly, he was given an abundance of the thing his life most depended on - and he chooses to leave it all to follow Jesus. Becoming a disciple of Jesus cost him something. He leaves his abundant livelihood for the abundant life of discipleship. Peter’s encounter with Christ leads him to abandon the attachments of his world. It leads him to place his trust in Jesus and embark on an incomprehensible mission, catching people, instead of fish. The same is true for us. In every moment, in every situation, God calls us - even when we feel unworthy, incapable, and sinful - God calls us to action and obedience. Perhaps there is another clue in our text today about what the cost discipleship looks like. Jesus instructs Peter to put his boat out into the deep water. There is a subtle connection between the deep water here and the deep water of the primordial sea, a powerful Jewish symbol of chaos. In Genesis, when the breath of God, ruach, hovers over the face of the waters - God is imagined to be hovering over chaos. God brings order to chaos in creation. Chaos abounded in Jesus’ time and chaos abounded in Luke’s time. Chaos abounds in our time. Yet, the deep waters of chaos is where Jesus often calls us to go. We are called to follow Jesus - but follow him where? We may be called to follow him into places of chaos, places of pain, darkness, loneliness. We may be called to follow him to places of discomfort and uncertain futures. We may be called to abandon the abundance of our worldly pleasures to follow him. The most profound and significant experiences of God are not usually found in the safety of shallow waters - but in depths of the unknown. Discipleships urges us follow God’s call on our lives, even when it’s costly. Did you know a majority of Christians believe that God calls other people - but rarely recognize God’s call on their own lives? God calls everyone else, but rarely believe God calls them. But God calls each of us in all kinds of ways - big and small, dramatic and simple. During one of my seminary classes I had the opportunity to meet Mike Simons, a photojournalist for the Tulsa World and then started following him on social media. Last week, he posted a story of a Tulsa man who has chosen costly discipleship. In a convenience store, this man ran into a man named Charles who had spent the past seven years in and out of homelessness. Charles was a former employee of the man and in the store he asked his former boss to rehire him. The man told him if he would get in his car right then and pass a drug test, he’d put him to work.” Charles was clean. He started work right away and the boss got Charles an apartment, paid all the deposits, got him clothes and some furnishings. Since Charles as no transportation, his boss takes him to work at 5pm and then picks him up by 2am - before going to work himself by 9am When asked why he would do such a thing, he said: "I just felt compelled in my heart to help him. When you do it to the least of these, you’ve done it until me. There was no one least in the world than him at the time.” There was a call on his heart, and he followed. I have the privilege of knowing a young man who followed a different kind of call on his heart. Following in his parents footsteps, he decided to attend college at the University of Kansas and major in architectural engineering. He had applied and was accepted. He future was bright and certain. Then, during his senior year of high school something changed. He told his parents he felt called to go into a different field. That led them on a last minute new college hunt with deadlines looming. He chose Wartburg College and is currently majoring in theology and business with a minor social entrepreneurship. He hopes to work for a non-profit when he graduates and make a difference in the lives of others. There was a call on his heart, and he followed. One of my favorite human beings is a man named Erv. He is an 80-something year old man with deep Lutheran roots and more energy than I can fathom. He is as white as white can be and doesn’t speak a lick of Spanish. And yet, this year he became the sponsor of a refugee from Cuba who is seeking political asylum in the United States. Working with the New Sanctuary Movement, Erv invited Julio into his home and into his life. What was supposed to be one week, has turned into seven months. Julio came to the US not speaking a lick of English. And yet the two live together in community. There was a call on his heart, and he followed. When God places a call on our heart, we are often called to leave the “big catch” and embark on an incomprehensible mission, venturing into the unknown. Sometimes we are called to simple tasks. Yet, it is our willingness to make a difference in the lives of our neighbors that matters most. We rarely feel ready, we rarely feel capable - and yet Jesus sees the potential that resides within us and empowers us to participate in the work of God despite our sinfulness. When God places a call on our hearts, may we be brave enough to say: Here I am, Lord. Is it I, Lord? Even though I feel completely inadequate and unworthy, scared and sinful: I will go, Lord, if you lead me. Though discipleship often comes with cost: I will hold your people in my heart and show them your mercy and love. Good News, Bad News, Who Can Say? There is a Taoist parable that goes something like this: A Chinese farmer works hard to get a horse but the horse runs away. The farmer’s neighbor comes by and says, “That’s bad news.” The farmer replies, “Good news, bad news, who can say?” After a couple of days, the horse comes back and brings another horse along with him. Good news, you might say. The farmer gives the second horse to his son, who rides it and is thrown off the horse so badly he breaks his leg. The concerned neighbor comes by again and says, “Sorry for your bad news,” to which the farmer replies, “Good news, bad news, who can say?” After a couple of weeks, the emperor’s men come and take every able-bodied young man to fight in a war. The farmer’s son is spared. Good news, you might say. I’m sure this parable could go on and on - such is life - but I think the truth that lies within the story is that good news and bad news are dependant upon perspective. What is good news for some, may be bad news for others. And vise versa - what is bad news for some, may be good news for others. In seminary, preaching professors, especially Lutheran ones, are insistent that good news should be explicit in each and every sermon. Last week, as we were wrapping up our sermon discussion, Pastor Rob even said - “Did you hear good news?” That was so very Lutheran of him! Good news is what we are all about! … And yet, we often fail to consider that this good news we seek to proclaim isn’t always immediately perceived as good news by all. Many times, the good news presents challenge and conviction -sometimes it’s hard to hear and we don’t like it. But even good news, that seems like bad news, can become good news when we embrace the challenge and allow it lead to action and transformation. In our Gospel lesson for today, we learn exactly what kind of Good News Jesus brings to the world. Jesus enters the familiar synagogue of his childhood in Nazareth, likely surrounded by people he has known all of his life - neighbors, teachers, aunts, uncles and cousins. It was a small village and what is true for small towns today was surely true for Nazareth. In those days, the synagogue served as a sort of community gathering place. People would take their sacrifices and worship at the Temple, but they would gather for continued study in community synagogues on Shabbat. The people would gather together to recite the Shema - “Hear, O Israel, the Lord our God, the Lord is One.” They would pray and collectively say “Amen.” They would read from a scroll a portion of Torah - one of the first five books of the Hebrew Bible - and then they would read a portion of Nevi’im - one of the Prophets. Jesus declares his mission that day for all to hear. Jesus proclaims his mission of good news for the poor, for the captives, for the blind and the oppressed. Jesus offers freedom and forgiveness for all of humanity. Those who lived in poverty and oppression would hear good news of joy and hope. When we hear the words of Jesus, we hear good news! And yet, those same words might have sounded like a different kind of news to those whose wealth, status and power had afforded them a certain kind of privilege. Jesus claims that his ministry will be like the year of the Lord’s favor - also known as the Jubilee year! The people would have understood exactly what Jesus was referring to. In Leviticus Chapter 25, the law states that every 50 years the people would celebrate a Jubilee year in which the fields would rest (nothing was to be planted or harvested), debts would be forgiven, land acquired through debt would be given back to the original owner, and slaves would be set free. He was offering forgiveness for all. This sounds like good news, right? Jubilee years were awesome …. unless you were the one who was owed a debt, or you were the one who had acquired land or whose fortune relied on the work of slaves. The elite didn’t much like the idea of a Jubilee year, which is probably why the practice was never really followed. Good news, bad news, who can say? Jesus does a funny thing as finishes the reading from Isaiah. He reads Isaiah 61:1 and then starts to read the second verse - but does not finish it. He reads the first part of the verse about the freedom of the Jubilee year but doesn’t finish the rest. What words does he choose not to read from the scroll? The completed verse would read: “to proclaim the year of the Lord’s favor, and the day of vengeance of our God.” He completely leaves out the part about vengeance! In what he doesn’t say, Jesus clearly makes it known that the vengeance of God is not what he has come to fulfill. Revenge and retaliation are not his gig. Good news, bad news - who is to say. I guess it depends on if you are a person who has been waiting for the Messiah to come and bring vengeance on the enemies of Israel. Now, the rest of the story is our Gospel lesson for next Sunday, so I can’t completely steal all of Pastor Rob’s thunder … but perhaps you remember how the day in Nazareth ends for Jesus. They don’t throw a party and eat cake in his honor after the famous teacher concludes his teaching. What begins with praise and amazement, soon turns to rage, and they try to throw him off of a cliff. What starts as good news, becomes bad news - or who can say? Here is what I will say: Good news is not always easy. Good news can be hard - but that doesn’t always make it bad. Good news most certainly holds challenge. A couple of Sundays ago, we heard God proclaim Jesus’ identity as the Beloved Son of God, after he was baptised in the Jordan River. Today, when Jesus unrolls the scroll of Isaiah, to read and proclaim the scripture fulfilled - Jesus claimed his mission of good news. From the beginning of his ministry, he very clearly knows who he is and what God has called him to do. Everything he says and does going forward can be viewed through his interpretation of this scripture which he claims as his mission. His good news - is first and foremost - for the poor, the captives, the blind and the oppressed - and forgiveness is for the whole of humanity. Jesus doesn’t lay out doctrine to believe or rules to follow - his missional target is a moral agenda that fulfills God’s good purposes for all people. And he lives it. The Gospels are full of stories of Jesus living out his mission. Remember the blind man who receives his sight after Jesus spits in the mud? Remember the Gerasene man who is held captive by demons outside of the city walls who is released? Remember the woman who is caught in adultery who set free from condemnation? Jesus knew his identity and mission, it shaped his actions, and transformed the world around him. It wasn’t easy. The Good News Jesus proclaimed and lived led to his death on the cross. Good news, bad news, who can say. Often times, the church can forget that we too have an identity and mission. We get caught up in trying to believe the right things and follow the right rules. We get tradition-focused tunnel vision and have a hard time seeing beyond things as they were or have always been and moving forward. And yet, it is just as important for us as the church to know our identity and mission - to understand what it is God is calling us to do - as it was for Jesus. Jesus’ identity was revealed in his baptism and his mission was stated in Nazareth - both serving as the foundation of his ministry. The same is true for the church. In baptism, our identity is given to us individually and collectively as we are claimed and united as the church. Letting our identity and mission shape our actions is how the church transforms the world. Just last Sunday at our congregational town hall meeting, First Lutheran discussed a new working mission statement. For those who weren’t here - or for those who have already forgotten it - here it is: “First Lutheran Church strives to inspire hope for a wounded world, gather in worship that both uplifts and challenges, and build blessed relationships inside and outside the walls of our building.” It’s a clear statement that lines up with the mission of Jesus. And yet it leaves room for challenge. Actually, it recognizes and celebrates that in the midst of good news there is always challenge. A congregation who strives to inspire hope for the wounded is going to face some challenge. Wounded people bring with them their wounds, which can be messy. The church sign right now ((No Body is Illegal. Protect Transx Rights!)) inspires hope for our wounded world - speaking a word of dignity and support to our transgender friends - and yet it’s challenging. Not everyone who drives by will agree. But it is there to inspire hope to the wounded. First strives to be a congregation who gathers for worship that both uplifts and challenges, well the challenge is built right into that one. The words that you hear from this pulpit might not always bring comfort, changes in worship might not always be comfortable - but you have committed to gather together despite the challenge, recognizing that challenge helps us to grow. First strives to be a congregation who builds relationships both inside and outside of this building - that’s challenge! Building relationships with people in here is hard enough - but with those people out there? Talk about having to leave our comfort zone and get out of our box! Those people out there - they aren’t going to look like us, think like us, act like us - they might not even like us! But this mission reflects the mission of Jesus and it’s what we have been called to do. This mission is good news, yet let’s not kid ourselves. It’s not an easy task. And it is no good if it just words on a page. We can print it in the bulletin and put in on the website - but if we aren’t continually confronting challenges, taking action, and putting it into practice - it’s nothing more than good intentions. Bold action will call for willing hearts and hard work; and I am certain it will require big risks. But it’s a mission that is good news for others - not just those in here, but those out there! Good news that is good, not because it’s easy but because it’s right, it’s just, and it brings us closer to the world as God have it to be. What a privilege it is to partner with God in this work! A new mission is an opportunity for new action. So, how will First Lutheran let it’s identity and mission shape its actions to transform their part of the world? Who can say - but I believe it can be good! When I was a little girl, Christmas joy was easy to come by. I remember laying underneath the Christmas tree, consumed by the fresh scent of pine, staring up at the Christmas lights as they weaved their way over and under the branches, and listening to Burl Ives sing Rudolph the Rednosed Reindeer from the television. Simple Christmas joy. I remember the man we rented our house from coming by to deliver a huge basket full of apples and oranges, Christmas candies and nuts. I loved cracking open the walnuts and picking out the plump bits to eat. Simple Christmas joy. Joy seemed easy to find amidst the stockings hanging by the woodburning stove, hot cocoa topped with marshmallows, and time spent with family. As an adult, the joy of Christmas has honestly been harder for me to catch hold of. The season is so busy and rushed; stressful and anxiety producing. There are presents to buy, parties to attend and never-ending traffic. I’ve worked in the church most of my adult life which adds its own frantic activity. There seems to be nothing easy about finding Christmas joy anymore. And yet, every year, I long to be filled with the joy and wonder of a calm and bright Christmas. I do find joy in this Calm and Bright series we are taking part in this season...even if only because I feel a little rebellious reading the Christmas story during Advent and singing Christmas songs before Christmas Eve. And we are talking about joy this morning instead of peace! What rebels we are! For a mainline, liturgical denomination, this is a pretty big faux pas. And yet, here we are at the beginning of December hearing of the shepherds keeping watch over their flocks by night and singing Hark the Herald Angels Sing. Although we like to imagine the night Jesus was born as calm and bright, I’m not sure it was. There’s not much that is calm or bright about a baby being born surrounded by the sights, sounds and smells of animals. There’s not much that is calm about shepherds being spooked by angels and leaving their flock of sheep to find a baby. Especially when we consider that those shepherds most likely had a life that was anything but easy. The shepherds in our story were the night-shift shepherds. They didn’t own the sheep, they didn’t own the land. They were, most likely, low wage hired hands or indentured slaves. They were at the bottom of the social structure, the outcasts and nobodies. And yet, this familiar story tells us the glory of the Lord shone around them. God chose these guys! This phrase, “The glory of the Lord” is used throughout the Hebrew Bible and New Testament alike. Most often it refers to God’s presence and strength and is often associated with light. Sometimes God’s glory comes in a burning bush or a pillar of fire. Sometimes is comes streaming down from the stars above in an open field. One thing is sure, in moments of glory, God draws near. Divine presence is made known. There is an intimate connection between the glory of God and joy. Joy is deeper than the happiness of circumstance; joy pours out from a spiritual connection to Divine presence. Glory and joy go hand in hand. On the night when Christ was born, God’s glory, God’s presence, came first to lowly shepherds. But instead of being in awe and filled with joy - the shepherds were terrified. The presence of God was shining on them - and instead of basking in the glory of the moment, their gut reaction was fear. “And they were terrified.” Now, to be fair, I’m not sure multitudes of singing angels were a usual part of their nightly routine. There probably wasn’t that much excitement taking place in the shepherd’s fields outside of Bethlehem. Of course they were afraid. Their fear shouldn’t surprise us, especially when we begin to consider our own responses to moments of joy. How often do we have a split second response of fear in moments when we are overwhelmed by God’s presence, moments of joy? Can you think of a time that you experienced a moment of pure joy, only to be filled with dread? There are lots of catch phrases for this: waiting for the other shoe to drop, expecting the worst, not wanting to tempt fate. If things go too good, we seem to look over our shoulder, waiting for the bad news or disappointment that is sure to follow. Or, instead of sinking into a moment of joy, we are overcome with thoughts like: Who am I to be happy? How can I let myself feel joy when other people are suffering? How can I be joyful when a loved-one is not here to share the joy with me? Research has actually shown this to be true. Dr. Brene Brown, a social worker and research professor who studies fear, shame and vulnerability, spent several years conducting research on feelings of fear in vulnerability. To her surprise, she found that fear was often connected to times of joy. When she asked people about the times in their lives that they experienced the most fear or vulnerability - their answers were similar: the birth of a baby, watching children while they sleep, falling in love, being promoted, getting engaged, realizing how good they had it. These experiences of joy are actually the moments people often feel most vulnerable and afraid. I can relate…..walking down the aisle on my wedding day, taking my babies home from the hospital, watching my daughter drive away after getting her drivers’ license, even getting on an airplane to travel overseas. In each of these instances, joy was accompanied by fear. Instead of letting myself lean into joy - I push it aside because I, too, am terrified. And it’s not just fear; other things creep in to try to steal our joy, too. I’ve heard it said that comparison is the thief of joy - I would agee. When we spend our energy comparing ourselves to others, joy evaporates. When spend our energy being stressed, worried, anxious, overwhelmed, or trying to meet unrealistic expectations - joy hard to hold onto - because we are not trusting in Divine presence. Yet, the angel spoke words of good news of great joy to the terrified shepherds. “To you is born this day a savior, who is the Messiah, the Lord.” Born to you, lowly shepherds. Born to you, people of Tulsa. And born to you, all people of the world. Why is this good news? Why is this joyful news? The news is filled with the promise that God’s presence comes to earth so that we will never be alone. Jesus comes to reveal the love and grace of God to us on earth. The Holy Spirit comes to fill us with Divine presence and peace. In our most vulnerable, fearful moments - God is with us. In our most joyful, wonder-filled moments - God is with us. That is good news of great joy to bask in. It is good news - and our response can be nothing less than praise and gratitude. Filled with joy, praise was the response of the angels. The angels sang of God’s glory, “Glory to God in the highest!” And the shepherds - after they calmed down a bit and saw the baby lying in the manger - they returned home, glorifying and praising God. Their joy led to praise and thanksgiving. Brene Brown’s research found a deep connection between joy and gratitude as well. Those people who said they experienced the most joy in their lives, were the people who engaged in intentional gratitude practices - they kept a gratitude journal, they talked about what they were grateful for each evening around the dinner table, they went to church with the intent of giving thanks and praise to God. She says, “The shudder of vulnerability that accompanies joy is an invitation to practice gratitude, to acknowledge how truly grateful we are for the person, the beauty, the connection or simply the moment before us.” Gratitude is the root of joy. We dispel fear by practicing gratitude. Glory streams all around us everyday, bringing us moments of joy. The presence and strength of God shows up in simple and ordinary ways. We can be too focused on expecting or searching for joy in the extraordinary and we can miss it. But, joy radiates from the ordinary. We just have to slow down long enough to recognize it and be grateful. You see, the world needs people - a church - not afraid but in search of joy and wonder. People who seek out beauty, who laugh with delight. The world needs people who stand in awe of our awesome God and who are filled with gratitude to our wonder-worker God. The glory that streams around us, it can stream through us, too. As Christmas draws near, I invite you to open your eyes to the glory streaming down all around you. Open your heart to joy. Give thanks for all of the ways that God’s presence is made known to you. Don’t take those moments for granted - celebrate and give thanks. And may this practice help you experience Christmas through childlike eyes of wonder, bringing you simple Christmas joy. In our Scripture readings, we meet two women who have nothing. We don’t know their names, we don’t know many details of their lives. Yet, somehow their brief encounter with the holy makes it into our Bible. We gather together, we hear their stories and we wonder how their stories might inform the stories of our lives today. These women of meager mean offer all they have - one offers bread and the other, her two coins - and somehow, here we are, thousands of years later, remembering their sacrifice. In the Hebrew Bible lesson from 1 Kings, the widow of Zarephath and her son have suffered much during a time drought - a drought predicted by Elijah - brought on by the wickedness of King Ahab and his worship of Ba’al. When we encounter her, the widow is just about to use the only grain and oil she has left to make a bit of bread for her and her son to eat before they die. And then Elijah approaches. Elijah asks her to give all that she has left for the sake of his life. The Lord the God of Israel promises her jar will not go empty until rain comes down from the sky. Trusting this word, she does as Elijah asks and the jar of meal is not emptied, the jug of oil does not run dry. The woman, her son, and Elijah - they all live. When death was imminent, this woman who had nothing left, trusts in God and finds new life. In the Gospel reading, we find another widow. This widow comes to the Temple to put her offering into the treasury. She is surrounded by a large crowd of people who are putting in large sums of money into the temple treasury. And yet, she drops in her two small coins. The coins she drops in are the smallest coins circulated. It would take 64 of these coins to equal one denarius, which was one day’s wage. Knowing these coins were all she had to live on, Jesus sees her. He sees her and calls attention to the sacrifice of her offering. Many times, these stories bring our focus to sacrifice and offering. These women sacrificed all they had, offering it to God. When we think about sacrifice, we think giving up something up, something of value or of great worth, for the sake of someone else. We think of all the people of the world who have sacrificed so much - Brave men and women who sacrificed their lives for our freedom. We remember their sacrifice, especially today on this Veterans Day. We think about people who have sacrificed so greatly - Faithful men and women who sacrificed their lives for the creation of a better world, Mother Teresa, Martin Luther King, newly canonized Oscar Romero. We remember them as saints who changed the world. In these terms, their sacrifice is almost like an exchange - lives for freedom, lives for a better world. But at its core, sacrifice means to make sacred. Sacrifice is offering something of value as an act of devotion to God. And our offering is not our money or our possession or materials things - our offering is our very being. In the ancient world, without a man to care and provide for them, to protect and keep the safe, widows were the most vulnerable of all people. Yet, these two widows in our texts today offer all they have - all that is left of their very lives. Their sacrifice isn’t in what or how much they gave, but that they offer themselves as a sacred act of devotion, trusting that their gift is enough. The most powerful offering that we have to sacrifice is our very selves. There is enormous power in offering all of who we are to the rest of creation, trusting that we are enough, and God will use us for good. That’s the hard part, though - trusting we are enough. That takes courage and vulnerability. I don’t know about you, but more often than not I get caught up in reminding myself of my own lack. I don’t have enough - enough time, enough space, enough love, enough stuff, and of course, there’s never enough money. I spend my head-space reminding myself of my own inadequacy. I am not enough - good enough, smart enough, talented enough, happy enough, successful enough. Yet, as Jesus tells his disciples, the widow in her scarcity contributed more than those giving from their abundance. I may think I live in scarcity but even my thoughts of scarcity are worth more than abundance when offer all I am and trust in God to use it for good. Our scarcity doesn’t mean we search for abundance, but rather choose a different mind-set. My friends, you are enough. And when you give yourself to the world, trusting that you are enough, you can find more passion, and meaning and purpose than you ever thought possible. These widows invite us to trust in sufficiency. All we are, all we have, is sufficient in the hands of the Creator. Now, I'd like us to consider for a moment to whom these widows give their offering. The first widow gives the last of her bread to Elijah, which might not seem like a big deal at first. After all, he was a prophet of God! But a woman from Zarephath would not know that. You see, the people of Zarephath were Gentiles. Remember that the drought was said to be caused by King Ahab’s worship of Ba’al? The worship of Ba’al began when he married Jezebel, who was also from Zarephath. The widow sacrificed all she had left for an outsider - an “other” - someone she may have deemed unworthy. And what about the widow in our gospel lesson? She gives her coins to the treasury of the temple. Abstractly, we might imagine her giving her offering to God - but who does she literally give her coins to? She offers her coins, all she has, to the very institution devouring her house. Remember the first part of our reading for today? Jesus points to the scribes who walk around in their long robes, demanding respect and expecting to be seated in places of honor in the synagogues and at banquets. These scribes were the legal and financial gurus of the day, working for the religious authorities. One of their jobs was to oversee the affairs of widows, who with no husband, were in a defenseless legal and financial position. And so, these supposedly well-reputed and pious scribes who were to oversee the estates of widows, would instead use the estates for their own financial gain. Jesus warns his disciples about religious hypocrisy - those who profess to be faithful but whose power and elitist attitudes lead to corruption. The scribes were part of the very institution that was feeding on the vulnerabilities of the poor. And yet, the widow offers the whole of her life to the very institution that exploits her poverty and social position. Seems crazy, doesn’t it? But it happens all the time, even today. People send their money to televangelists so that they might be blessed by God with promised prosperity. People cast their vote for the very politicians who want to take away their health care and social services. I recently read “Killer of the Flower Moon” and what happens to widows in Jesus' time is very similar to what white men were doing to Osage women in the 1920’s when they would marry them to gain control of the wealth of their estate only to have them murdered. Even in the face of otherness and corruption, the widows sacrifice everything. Please do not hear me say that I am advocating for destructive relationships. I’m not justifying unjust systems, or condoning evil masquerading as care and protection. We must continue to stand against corrupt people and systems. Instead, I would like us to consider that the widows’ stories aren’t too different from the path of Jesus. The story of the widow and her two coins is the last scene of Jesus’ public ministry in the Gospel of Mark. From here, Jesus tells of the temple’s destruction and the Passion narrative begins. But in this final scene of the widow’s mite, we are shown a glimpse into what Jesus himself is all about. Jesus is on his way to give “the whole of his life” for something corrupt and condemned: all of humanity, the whole world. He knows it, and he offers himself as a sacrifice anyway, offering all of who he is in a sacred act of devotion to God. Why? Because Jesus believes the goodness of God’s creation is greater than the darkness, the brokenness, the not-good-enoughness of the world. When we offer whole selves to the world as a sacred act of devotion to God, we can trust that God believes we are more than enough and God will use all that we offer for the good of the world. Even when we ourselves don’t feel like we are enough - like the brokenness of the world is too big and we are too small - we are reminded that God’s grace is sufficient and our lives are too. Following in the way of Jesus, we are called - both individually and as a church - to sacrifice our lives as an offering to be shared with others. Even if the world will devour us. Even if the world is corrupt. Even if people are awful. Even if evil exists. May we too, as people of faith, offer our lives to others as a sacred act of devotion - even though the world may devour us - because our trust in God’s goodness is greater than the darkness of the world. When I was at Oklahoma State University in the late 90s, there was one person on campus that everyone seemed to know. He would show up intermittently, usually around the library, and draw great crowds of people. His name was Preacher Bob and everyone seemed to know exactly who he was. If you were to ask him - he would probably tell you he was a prophet. Standing on a box and shouting into a megaphone, he would tell us college kids that God had called him to condemn our evil ways and said if we didn’t change our ways, we would go straight to hell. Crowds would gather, to jeer and mock him - and he would banter back and forth - calling girls sluts and people he deemed gay abominations. I always wondered exactly who he thought he was actually going to save. For awhile, this was my view of prophets - crazed men who stood on boxes shouting warnings of hell at the masses. And yet, during Seminary, I came to a much different understanding. I came to have a deep admiration and love for the prophets. I spent an entire semester studying eighth century prophets and found that yes, most might be crazed men - but it takes a bit of chutzpah to leave one’s home and deliver a challenging message from God to a people that don’t want to hear what you have to say. But unlike Preacher Bob, Biblical prophets did not condemn people to hell. They may have warned of consequences and impending doom, but they always offered a word of hope and redemption, as well. They were watchmen, servants, messengers of God. What I discovered was that prophets revealed God’s love to the world; they revealed God’s heart. I love the prophets because even though their message was for specific people, in a specific place and time - their words can speak to us, too. Their words are alive and active, even now. And so, I would like for us to spend some time with the Hebrew Bible lesson from Amos in hopes that the heart of God might be revealed to us in a new way and we might hear his message of hope and redemption in the midst of our reality. Amos lived in the 8th century BCE during the reign of Jeroboam II when the kingdom was divided - Judah to the south and Israel to the north. Amos was a shepherd, a highly respected sheep-breeder from Tekoa, a village southwest of Bethlehem in the Kingdom of Judah. God calls this man from south of Bethlehem and sends him all the way up north into the Kingdom of Israel. The Kingdom of Israel was experiencing its greatest time of peace and prosperity under the rule of King Jeroboam II. The book of Amos describes the great pride of the Northern Kingdom. It speaks of the splendor of the land, the elegance of the cities, and the might of its palaces. It tells us the rich had summer houses and winter palaces adorned with expensive ivory and gorgeous couches with damask pillows for the people to recline upon. Life was good in the Kingdom - unless it wasn’t. Although there were great riches and wealth for some, it was also a time of great poverty and suffering for others. The poor were afflicted, exploited, and even sold into slavery. And so, a great divide existed between them - the rich and the poor. In our text, Amos’ audience was the wealthy upper class of Bethel. Bethel was one of the great religious centers of the Northern Kingdom, the place God’s chosen people would gather for cultic worship and ritual. They believed their wealth was given to them by God because of their perfected rituals in their grand sanctuaries. They also believed, as God’s chosen people, that they held special status, which made them exceptional and blessed just because of who they were. It is into this particular moment in human history that Amos is called by God to speak. Amos is called to offer divine understanding to this human reality. Amos confronts the dissonance between what is happening in worship and what is happening at their gates of justice. Amos reveals the heart of God - a heart that longs for justice and righteousness. Justice and righteousness are paired throughout the writings of the prophets and wisdom literature. For prophets like Amos, justice and righteousness were intimate companions; they were not abstract concepts but were lived out in real ways both individually and as a community. Justice, mispat in Hebrew, refers to behavior and practices that come from moral and ethical living. Justice is ethical action; acting based on one’s morals. And righteousness, sedeqa in Hebrew, refers to a right relationship with others that flows from a right relationship with God. Amos pairs these words in verse 7, and says to the people, “You turn justice to wormwood and bring righteousness to the ground.” Amos calls them out, saying their pursuit of justice has become wormwood, a plant that smells beautiful on the outside, but inside it contains a bitter extract. Justice in the gate may have looked fancy and elite, but the people had turned it bitter and made it useless. And they had thrown righteousness to the ground. Instead of being in right relationship with the poor, they trampled the poor into the dirt of the earth. The needy who sought justice were pushed aside and treated unethically. The people’s sin was their disregard of just practices and right relationships. It seems the neglect of just practices and right relationships has always plagued humanity. We hear the familiar words of Amos echoed by Dr. Martin Luther King: “But let justice roll down like waters and righteousness like an ever flowing stream.” Isn’t it amazing that the same cry for justice and righteousness has been proclaimed for thousands and thousands of years? It was the cry of Amos, the cry of MLK - and it is still our cry today. And yet. And yet Oklahoma has the highest incarceration rate in the country. We have the highest incarceration rate of women in the whole entire world. In Tulsa, black teenagers are more than three times as likely to be arrested as white teenagers and black people are more than twice as likely to experience officer use of force as white people. What is is it about the justice that happens at our city gates that produces so many inmates and so much disparity between peoples? Through the Criminal Justice work of ACTION, I heard the story of one Tulsa attorney whose client is part of our state’s disparaging statistics. Her client was a woman who was caught shoplifting shoes for her child because her child had no shoes. Maybe it was time for school or maybe winter was coming and she was desperate. When she was arrested, she was not charged with a misdemeanor, but with a felony for child abuse. She was kept in jail for such a long period of time that she lost her housing, her job, and her transportation. Her situation went from bad to tragic. In the end, the felony child abuse charge was dropped, but her time in jail already had terrible consequences for her and her family. Detained immigrant children are currently being adopted to American families without the consent or knowledge of their own parents. Elderly people are the victims of fraud and exploitation everyday, falling through the cracks of our justice system. Black men die, women are sexually assaulted - and their assailants go free. What is is it about the justice that happens at our city gates that fails to protect the vulnerable? And what are we called to do about it? Perhaps our calling is found in Amos’ message of hope and redemption. Standing on his box, holding his megaphone, Amos does not condemn the people to hell but offers them life. Four times in Chapter 5, Amos calls the people to seek the Lord, and the result of their search is life. In Hebrew, the word life is a word that means much more than mere existence. Life isn’t just having a pulse but it is living abundantly. Life is vitality, health, honor and prosperity. All of these things are yours, Amos says, if you seek God. Amos says, “Seek good and not evil...hate evil and love good, and establish justice in the gate.” There may be many ways to seek God, but for Amos, seeking God is to seek and love good and establish justice. Seeking God looks like actively working for a just society. When the privileged of a society manipulates the system for their own selfish gain at the expense of the poor and marginalized, “seeking God” involves publically rejecting these forms of evil and working towards the establishment of justice and righteousness. In our Gospel lesson, a young ruler with many possessions comes to Jesus seeking life. He knows the commandments and has obeyed them all. The proof was in his great blessings! And yet something was missing. He asks Jesus what more he needs to do. Jesus reveals the heart of God - sell all of your possessions, give the money to the poor, and come and follow me. It seems the man had things backwards, too. He had been seeking life through rule following and the accumulation of wealth and power, instead of seeking God through active love of neighbor. It is seeking God that leads to life. Both Amos and Jesus invite us who seek the way to life - to seek the heart of God first. For it is in seeking the heart of God - actively pursuing God’s goodness, God’s justice, and God’s righteousness - that we find abundant life has been ours the whole time. When I was a little girl, I loved to play with frogs. It didn't matter that I heard they gave you warts...I found them fascinating. I would look a frog square in the eye and wonder, "What do you think about this world, Mr. Frog?" Now, I don't think a frog thinks much of this world. Because, did you know, when a frog looks at the world, its eyes can only perceive four differents types of phenomena? Frogs can see clear lines of contrast, sudden changes in light, outlines in motion and the outlines of small, dark objects. That’s it. A frog doesn’t see the sweet face of a little girl as she peers at it inquisitively. A frog can’t see the bright colors of an Oklahoma sunset. It only sees what needs to be seen for survival: tasty bugs or the quick movement of a bird looking for dinner. Poor frog - he’s sure missing out. Thank goodness that WE can see all of the beauty of the world! Well, we THINK we can see everything - until we learn that bees can see patterns written in ultraviolet light on flowers and owls can see with precision in the dark. Actually, as human beings, our perception is limited. We only perceive the sensations our brains are programmed to comprehend; we only recognize the things for which we have mental maps or categories. Our mental maps help us make sense of the world. I know this all sounds rather weird, and it’s about to get even weirder. But, hopefully, you’ll hang with me and we can tie it all together in the end. I'd like for you to take a look at the nine dot puzzle below because we are going to use this puzzle to help us understand how our brains use mental maps to make sense of the world. 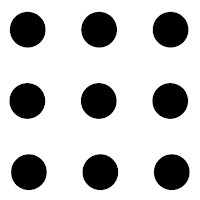 Here are your instructions: Join all nine dots with four straight lines, without taking pencil from paper. When we give ourselves permission to think beyond the box, we open our minds to new possibilities. When we create a different frame for the data, new possibilities appear! If you think about it - all of our perceptions about the world are invented in one way or another. Our stereotypes and bias about other people, our institutional structures, our politics, and even our religions are constructs. They act as maps that help us make sense of the world. But what might happen if we began to notice what could be outside of the box? What might happen if we were to break through the barriers that constructs create for us and for others? When we can imagine and dream about what could happen in the space outside of the nine dots, new ideas and actions can come alive. With a different frame, new possibilities appear. Could it be that this is what is happening in our gospel lesson for today? Could Jesus be having a change of heart, an ah-ha moment? Could it be that Jesus is being opened up to new possibilities and discoveries about his own mission in the world? You might be asking yourself - “What does Jesus have to ah-ha about? Didn’t Jesus already know everything?” Honestly, it depends on whose Jesus we are talking about - Matthew’s, Mark’s, Luke’s or John’s. A careful reading of the texts tell us - yes, John’s Jesus clearly knows everything. But Mark’s Jesus - well, he is still figuring things out. And with the help of the Syrophoenician woman, Jesus is opened to the possibility that his mission is even bigger than he thought. In each of these stories, Jesus is in Gentile territory. The region of Tyre and the region of the Decapolis are both places of Gentiles. The text tells us Jesus goes there to get away. But that doesn’t happen does it? He enters a house, not wanting anyone to know he is there, and a Gentile woman who has a daughter with an unclean spirit, wants his help. And he says: “Let the children be fed first, for it is not fair to take the children’s food and throw it to the dogs.” This statement takes us a back a little, doesn’t it? We’re not often offended by Jesus, but this seems pretty harsh. We can take the discomfort of Jesus’ words and do several things with them. We could say that Jesus was just testing the woman. Or We could say that these words weren’t as offensive during the time of Jesus and that this was more of a familiar proverb like “charity begins at home.” Or we could say that this little bit about the dogs is a redaction, added in later for affect, and Jesus didn’t really say it. Okay...those are all possible interpretations. But what if Jesus means the words exactly as we hear them? “Let the children be fed first, for it is not fair to take the children’s food and throw it to the dogs.” What if Jesus was responding to the woman out of the social constructs of his day? After all, she was a Syrophoenician, meaning she was from Syria and a Gentile. These are as much religious labels as they are racial labels. She was a foreigner and an outsider. She was also a woman, with no status, and she should never be talking to this man, let alone this rabbi, in the first place. And her daughter had a demon - perhaps a mental illness - either way, it was thought to be caused by sin. This woman is the worst of the worst. And Jesus is tired. He wants to rest. He’s been feeding and healing and teaching. If you remember from last week’s Gospel lesson, Jesus had just laid into the Pharisees for being hypocritical in abandoning the commandments of God and clinging to religious customs instead. Wait...isn’t that exactly what Jesus is doing? Except here, social conventions are dictating who is worthy of God’s healing love and mercy. Is it possible that Mark is describing a conversion moment for Jesus, a moment where Jesus faces his own hypocrisy and struggles with his own mental maps of humanity? If so, the Syrophoenician woman prophetically calls Jesus to a mission of infinite compassion and mercy. Jesus immediately acknowledges and affirms his mission by healing her daughter because of her boldness. The eyes of Jesus are opened just like the ears of the deaf man unable to speak in the very next story. Ephphatha - Jesus speaks this one word to the man and his ears are opened and is tongue is released. You and I, we construct boxes and barriers around people each and every day. We decide who is in and who is out, who is worthy and who is not, who is deserving of dignity and respect and who is not. We may not go around calling people dogs, but our words and our actions illuminate our boxes more than we’d like to admit. Our church has been helping a woman who is recently situationally homeless. When Jayme first began to tell me pieces of her story she said that out on the streets she felt like nothing more than a dog. No one cared whether she lived or died and no one treated her with any dignity or respect. “I used to be a human,” she said, “but out there you’re just a dog.” And the words of today’s gospel rang in my ears. These stories of Jesus reveal that a worthless Gentile girl with mental illness, a good for nothing deaf man who cannot clearly speak, and a woman without the security of a home are indeed children of God. They are to be embraced and valued - they are worthy of dignity and respect and healing. For every box and barrier we create, God insists over and over again that they do not exist: not race, class, ethnicity, gender, age, sexual orientation or physical condition. When we imagine the possibilities of the world as God would have it be, we see there would be no such barriers between human beings. Political leaders wouldn’t mock journalists with disabilities, women wouldn’t be groped by bishops at funerals, and we wouldn’t be arguing about whether or not to burn our Nikes. Instead, we would be listening to the life experiences of others. We would respect their dignity as fellow human beings and listen, not to respond, but to understand their pain and situation in the world. We would recognize injustice for what it is and we would call it out. We would work together until our nation was an equitable and safe place for all people. When we begin to notice the space outside our boxes and imagine new possibilities, I believe we can begin to solve what puzzles us and transformation can truly happen. This is true for us as individuals and it is true for us as a church. We cling to our traditions and our constructs of the way it has always been and we forget that in all actuality it is really all invented. The church is bigger than these walls. Worship is bigger than our liturgy. The Divine Source is bigger than our denominations and our religions. The mission given to us by Jesus - to love God and love others - is so wide and expansive that the possibilities for living it out are endless. Yet, our boxes often confine us because outside of them, the world can seem scary and unknown. Yet, that’s exactly where the transformative power of God’s work through the Holy Spirit happens. Jesus shows us that God’s work is bigger than our boxes because our boxes are invisible to God. God does not need mental maps or constructs to make sense of the world. God’s perception is better than frogs, better than owls, and better than that of mere humans. God sees the whole picture, all the space, and reminds us again and again that the possibilities are endless. God says to us: Ephphatha - be opened - as individual people, to see the worth of all of creation. Ephphatha - be opened - as a church to see our mission in a new way. Ephphatha - be opened to change and new possibilities. Ephphatha - be opened to God working in the world in ways we never thought possible and open our hands to participate. It’s God’s work - we just have to open our hands to the endless possibilities. The people had been wandering for a long time. On a road that seemed to go absolutely no where, the sun beat down on them, the heat weighing down their bodies with exhaustion. The children cried to go home. But they had no home. They had been freed from enslavement and fled the only home they had ever known. They were hungry. And thirsty. And close to death. They cried out and God showed up, sending manna by day and quail by night. The people ate and were filled. Water poured from desert rocks and their thirst was quenched. God provided food. God provided life. The young widow slowly watched her grieving mother-in-law grow weaker and weaker. In those days, a woman was nothing without a husband - a man to provide security and worth. Yet, death had stolen the sons and husband of these two women. They had no men and no hope. The prophet was on the run. He had filled his days serving the one true God and speaking God’s word to the people. In a final test, he showed the king, the queen and all the prophets of Ba-al that their so-called god was no match for Adonai. When Baal brought nothing - God brought a blazing fire. Victorious, the prophet ordered all of Ba-al’s prophets to be slaughtered! But now it was God’s prophet who was on the run. The queen wanted revenge; she wanted him slaughtered. So, he hid in the desert - alone, worn-down, defeated. He was hungry. He was thirsty. And he wanted to die. But God sent a messenger to touch the prophet, to give him food and drink. Twice, he ate and he drank. He was given strength for his journey. The Scriptures are filled with stories like these. Both in the Hebrew Bible and in the New Testament, there are stories of men and women who were given a second chance at life because God provided bread. Throughout the Scriptures, and in the everyday reality of our lives, bread and life and intricately entwined. Maybe this connection is why our lectionary focuses on bread for five weeks: every single person on the earth can relate to the innate need to be fed. Stories about food and life are something we all can relate to. Yet, we also know human beings need more than physical nourishment. The hunger and thirst of the human condition is much deeper than aching bellies and dry throats. Exhaustion and fear - like the Israelites wandering in the wilderness; Destitution and hopelessness - like Ruth and Naomi; Despair and defeat - like the prophet Elijah. In modern times, psycho- therapists have found that anxiety is the emotional byproduct of the fear of not having enough. Enough what? Well, it depends on who you are. Anxiety producing fear cuts across economic divides. Some people are anxious about not having enough money to put food on the table for their families - an everyday reality for one in six Oklahomans. While other people experience anxiety about earning a salary that compares with others in their social circle, that will afford them lavish homes, top notch cars and luxurious vacations. Whether it’s having enough food or enough stuff - no matter who you are - the fear of not having enough creates fear, and anxiety, and despair. Chrystia Freeland writes in her book “Plutocrats: The rise of the New Global Super Rich and Fall of Everyone Else,” that this anxiety reveals there is something deeper driving our angst than mere economic security. Our longing for more comes from a spiritual hunger that cannot be satisfied by earthly things. Our hunger might be pacified by bread. But our deepest hunger requires something more - than just having more. And so God came to us - incarnate in Jesus - to be our bread, to be our more. In our Gospel lesson for today, we hear Jesus say once again: I am the bread of life. Not only will I provide nourishment for your bodies - but I will provide nourishment for your souls. I will provide comfort in your grief, hope in your despair, and peace in your anxiety. I am the bread that gives you life. Eternal life. Not just life in the world to come, but an abundant life now. A whole life now. A life of meaning and purpose, now. God steps into the muck of life to remind us that we are beloved. We are more than enough. And so, when we gather for communion, we gather to be fed. The bread and wine of the Eucharist serves as a reminder that Christ is present - with us, in us and through us. Yet even on days like today, when we won’t share in communion, we still gather together to be fed by one another. As Christ is the tangible revelation of God’s love - so are we to be as well. As Christ reveals God, so we reveal Christ. We become the living bread - Christ’s own flesh - for the sake of the world - and for the feeding of one another. We are fed not only by Jesus, but through community. And yet we gather on Sundays, in churches all over this city - and we don’t really know one another. And even when we do know the people gathered around us we grouse about that one and hang on to old hurts because of what that one did years ago. We live in communities but don’t even know our neighbors, and rarely interact with people who look, think and believe differently than we do. And yet, we are called to be the bread of life for one another. We are called to share in one another’s joys and pain, to build one another up and care for all among us. If we want to imitate God, we look to Jesus - and and love like that. In Christ we are given the gift of community; we are all connected to one another and are meant to be living bread for one another. Living in community, we are truthful with others and ourselves, we let go of anger and help those who are unable to work. We use our words for good - for building each other up. We forgive one another quickly and fully. We love like Jesus. Jesus loves fully and extravagantly - never anxious about not having enough or not being enough. He loves with abundance and plenty. Jesus is constantly pushing back on the notion of “what’s in it for me” and instead reminds us, “there’s enough for all.” This is how we are called to love one another in community. We look at Jesus and we love like that. Last year I went to Nicaragua. The people lived in plastic houses with dirt floors. Sometimes there was enough money for corn for tortillas, but during times of drought, there was only enough for gallo pinto - beans and rice. The people were hungry. And thirsty. But the sense of community among the village was astonishing. They cared for one another and shared with one another all that they had. It didn’t matter if they didn’t have food tomorrow, because someone needed food today. Even in in their extreme poverty, they fed the orphans living in the trash dump and sent overflowing baskets of fruit into the overcrowded prisons. God provides food. God provides life. He was hungry. And thirsty. And had come close to death. And so she fed him. Day after day, year after year. She fed him when he was hungry and gave him a home when he had no other choices. She gave him love, a place to belong, and a way out of a life-situation that was set up for his failure from the beginning. Eight teenagers applied for an internship with Tulsa’s Table this summer. They filled out applications, interviewed with the director, and were hired as apprentices to a Tulsa chef. They came hungry, and thirsty, and with painful stories but hopeful hearts. Now, they are learning where their food comes from, and how to prepare and cook food that nourishes their bodies. They enjoy feasting on their creations and are learning other skills important to life. They earn a paycheck and have a job to put on a resume. And their experience is centered around food and community. It’s a story as old as time - yet it is a story that is still being told each and every day. If you listen closely, if you watch carefully, the story of food and life is all around you. Called to be imitators of God, you are the bread of life. May you provide strength and life for others, may you build community, and be vessels of hope for those who hunger and thirst for more than this world can give. Amen.